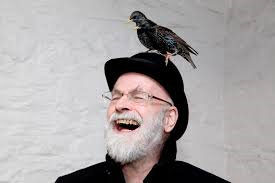 I am sharing this tribute to Terry Pratchett – courtesy of the wonderful poet, Marc Mordey. The Librarian utters a muffled, choking Ook! Angry mutterings issue from a star dusted, rainbow crazed, magical book. The Luggage lifts its lid in silent tribute. gone the stories, gone the gold. The Nightwatch nowhere to walk about. Ah, maybe, but are you sure?